The organization of FIG Artistic Gymnastics World Cup in Baku is awesome, former Croatian president (2000-2010 years) Stjepan Mesi? told reporters, Trend reports. "It is my first time in such a competition and I'm amazed how everything is organized wonderfully. For the first time I see the arena, which is designed for only one sport - gymnastics," he said. 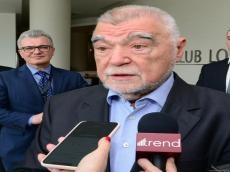 Speaking about the level of organization of the World Cup, Mesic said that Azerbaijan can be considered the world champion in this matter. Croatian gymnast Tin Srbi? came in second at the World Cup in gymnastics in the exercises on the crossbar.